It was back in June and July of last year that I posted about the Extra Desserts gums. I've had some of them and the entire concept fascinates me. While I'm not so sure I want to regularly walk around chewing apple pie flavored gum, I suppose its nice to know that's an actual option. I was surprised to see a new entry into the Desserts gum scene last week while checking out at Target. Lemon Squares is a good idea. 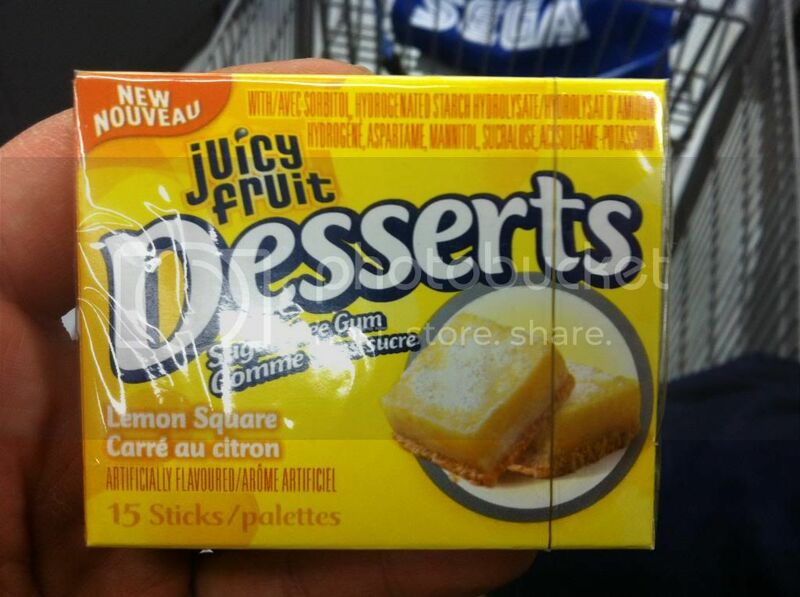 Not sure why they've dropped the Extra branding in favor of Juicy Fruit, but I'm sure there's some solid marketing behind that... Also hey've changed the name from "Dessert Delights" to "Desserts". Lemon Squares now adds to the already released flavors of Mint Chocolate Chip, Orange Creampop, Apple Pie, Strawberry Shortcake, and Root Beer Float. What other flavors would you like to see them take a crack at? I think Peanut Brittle, Black Forrest Cake, and (if you're Canadian you'll know this one) Nanimo Bars would all be great entries.